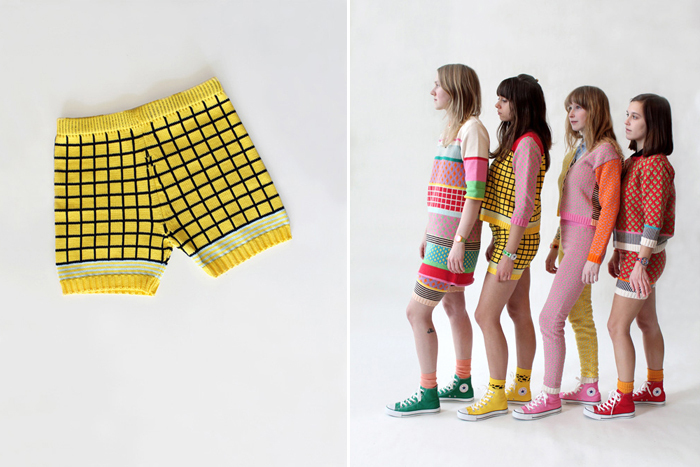 not sure how i can describe in words the joy that annie larson’s knitwear line, ALL, brings to me. i always thought that there was nothing better than a cozy, handmade sweater. warm, gentle, snuggly. 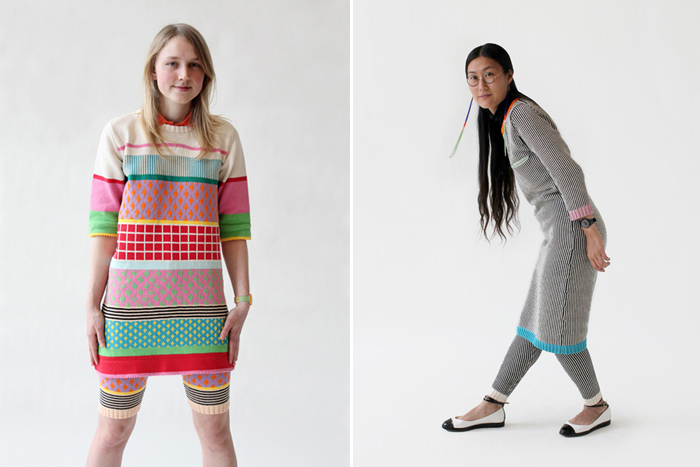 but what about a cozy, handmade sweater with wacky patterns in a rainbow palette? how about a cactus pattern? or a hand-waving-bye-bye pattern? stripes and triangles and soccer balls? jack-o-lanterns, anyone? yes yes yes yes yes, we will take it and we will love it! when i read on her blog that she was moving to new york from minneapolis, i thought it would be a perfect time for a BIG THINGS AHEAD interview. 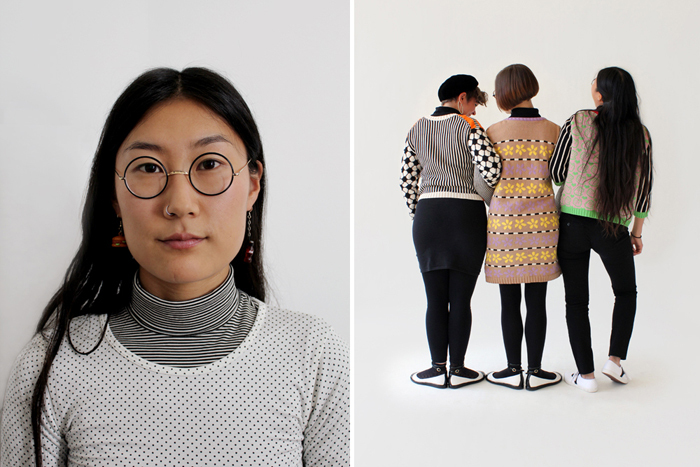 visit ALL knitwear to see more of the expertly styled and friendly lookbooks (with a cameo by jess hirsch, a great artist and old friend from my lewis & clark days!) 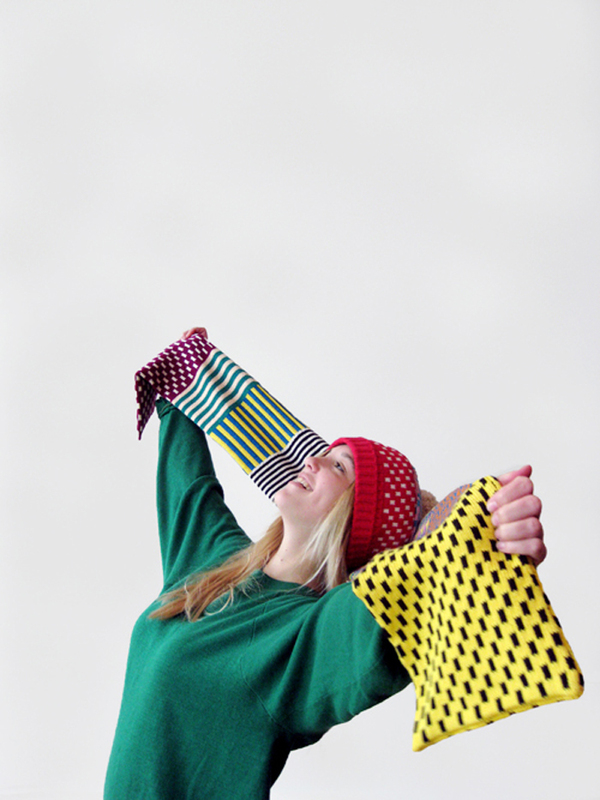 and pick up some knits for yourself or a friend. 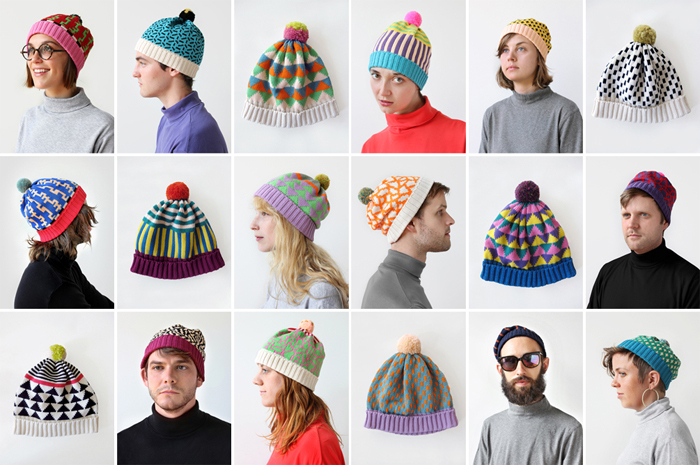 it’s winter- you deserve knit! Where are you right now? How’d you get there? Brooklyn, NY. I just moved here with my partner from Minneapolis, where we lived for ten years. Where are you going? I plan on staying put for awhile, but I dream about California. What will you be doing when you get there? I’ll probably be knitting, wherever I am. Who/what/where was the inspiration that lead you in this direction? I started making sweaters because I was fascinated with the knitting machine. I had never been specifically interested in knitwear in the past, but seeing what the machine could do changed all of that. I was learning about mass- produced sweaters at my job designing for Target, so it felt natural to move in that direction. How are you feeling? Are you excited? Nervous? Terrified? Thrilled? I’m feeling pretty good. I’m always a little bit nervous, but I think that’s natural. What kind of expectations do you have? I just want to keep learning new things and meet new people. Are you scared of anything? I’m particularly terrified of centipedes. What’s the worst thing that could happen? The best? That depends on the day! What are you taking with you/leaving behind? I have a history of being a pack-rat but have tried to slim down on belongings over the past year. Now, I’m trying to only keep things that I really want in my life and nothing more. What did your friends & family say when you told them? Everyone reacted differently and had their own way of dealing with it. It was hard but everyone is doing fine. How are you going to decorate your new space? Lots of colors? 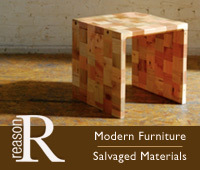 We are trying to be as minimal as possible these days. Our last apartment in Minneapolis was a big, open storefront that felt really dense with stuff after living there for a few years. We’re enjoying having white walls, doors, and sufficient lighting and are trying to decorate accordingly. floppy hat that serves a different purpose. I only wear stocking hats in the extreme cold, and then I usually just wear a sample I have laying around. thanks to annie & ALL for the photos! This entry was posted on November 28, 2011 at 8:13 pm and is filed under ART, BIG NEWS, BIG THINGS AHEAD, COLOR, DESIGN, FASHION, SHOPPING. You can follow any responses to this entry through the RSS 2.0 feed.